ZCORR Products has introduced a new Anti-Corrosion Softcase with a built-in, vacuum-sealable VCI corrosion-barrier bag providing airtight and waterproof protection for firearms. 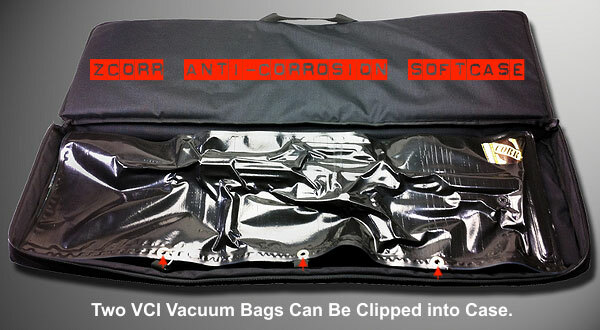 The 42″-long main gun compartment houses a VCI storage bag that clips into the softcase. ZCORR’s clip-in system lets you secure a second long-gun bag when two-gun transport is needed. Double-gun capacity is a plus because these cases are expensive — MSRP is $249.00. That’s ten times the cost of some basic soft-skin (fabric and foam) rifle carriers. While we like the idea of a soft guncase with serious built-in corrosion protection, it’s too bad that the case is only 42″ long. That size will hold ARs, and some short tactical bolt-guns, but it’s way too short for typical precision match rifles. 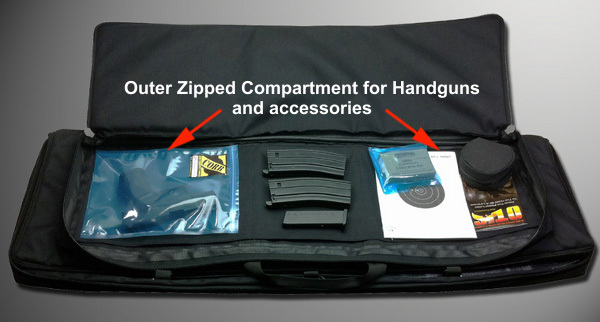 At least the ZCORR Softcase offers additional compartments for handguns and accessories. There is an 11”x35” front compartment for handguns and magazines. Other shooting accessories can be stowed in two extra pockets measuring 9″×12” and 9″×9″ respectively. COMMENT: For $249.00 one can get a quality, full-length hard-case and three or four 54″-long vacuum-sealable Vapor Phase Corrosion Inhibitor (VpCI) bags, big enough to hold a long match rifle with room to spare. A hard case with 54″ bags woud be a better solution for most precision rifle shooters than this first-generation ZCORR Softcase. Hopefully ZCORR will get the message that its current Anti-Corrosion Softcase is undersized (for bolt guns) and over-priced. Share the post "New ZCORR Anti-Corrosion Softcase"